RARELY AVAILABLE SOUTH FACING UNIT ON EAST END OF BUILDING/BEST LOCATION! NEXT TO THE HISTORIC/FAMOUS ARVADA WATER TOWER! UNIQUE W/2 DECKS, 1 OFF DINING ROOM, EAST NEXT TO THE WATER TOWER, 1 OFF MASTER BEDROOM, SOUTH W/AMAZING MOUNTAIN VIEWS! BOTH W/CITY NIGHT LIGHT VIEWS. THIS UNIT HAS BEEN COMPLETELY REMODELED/UPDATED W/ENGINEERED HICKORY HARDWOOD FLOORS THROUGHOUT, GORGEOUS WHITE SHAKER CABINETS AND RICH SLAB GRANITE. PERFECT ATTENTION TO EVERY DETAIL, UPDATED URBAN LIGHTING FIXTURES, CUSTOM CLOSETS, CUSTOM TRIM. TALL CEILINGS AND OPEN FLOOR PLAN WITH GREAT VIEWS! 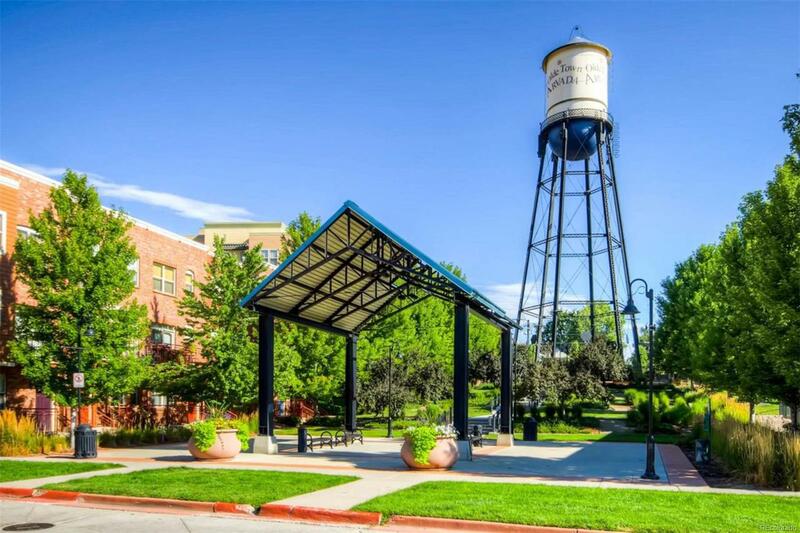 THIS LUXURY MID-RISE LOFT IS A LIFESTYLE PROPERTY W/A SHORT 2 BLOCK WALK INTO OLD TOWN ARVADA FOR RESTAURANTS/BREW PUBS/COFFEE SHOPS/ENTERTAINMENT/SHOPPING/LIGHT RAIL COMMUTING(coming) THIS URBAN COMMUNITY OFFERS A BEAUTIFUL OUTDOOR POOL/HOT TUB, LOADED GYM, SPECTACULAR CLUB HOUSE, INDOOR MAIL SUITE, SECURE BUILDING ENTRANCE, 2 ELEVATORS, HANDICAP ACCESSIBLE, 2 SIDE BY SIDE GARAGE SPACES AND A LARGE INDOOR STORAGE UNIT!